The eldest son is suddenly required to bring food to the table, as both his parents find themselves unemployed and adopt a rather passive stance to life. The son turns to prostitution to make ends meet, which eventually results in the disbandment of the family. Ο μεγάλος γιος μιας ελληνικής οικογένειας οδηγείται στην πορνεία για να καταφέρει να συντηρήσει τους άνεργους γονείς του και τον μικρό του αδελφό. Οι εντάσεις στο σπίτι οξύνονται και τα όρια δοκιμάζονται σε αυτό το οικογενειακό δράμα. Song River: Your topic chosen makes us look at our own selves, or we choose to turn away still... do we not? Natalia Bougadelli: We often turn away from the social challenges that face us, and we choose to ignore our mistakes, or to lose sight of what is important. Filmmaking and art in general is about reminding us of the stories that need to be shared. Art is about humanity and social connection, and about looking instead of turning away. That's what I hope to achieve with my work. Song River: What was it about this period of time in Greece's economic struggles that drew you to tell this story? Natalia Bougadelli: In times of crisis, be it financial or otherwise, people change and our routine is transformed. We get accustomed to realities that we normally wouldn't. Sometimes this process leads to innovation and positive alteration, but often it challenges our beliefs to the point of self-destruction. "The Owls" try to manage a balancing act that challenges our morality, our values and what we consider to be right. At the same time, Greece's economic struggles have led to a series of innovative projects and collaborations that prove that the human spirit is unbreakable. For that reason I chose to set my story in 2014 Greece. Song River: Overall what has been the reaction to the film, "The Owls?" Natalia Bougadelli: The reaction to the film has been very positive overall. It has participated in numerous film festivals worldwide, including festivals in the US and Canada, Europe and Asia. We are thankful that the film has also won many awards and distinctions and it continues its festival run. Song River: How did you go about choosing the actors who would play in your film? Natalia Bougadelli: We managed to bring together a wonderful team. Yiannis Kokiasmenos, the actor who plays the role of the father in the movie, is one of the actors whose career I have followed for many years, and he starred in Panos Koutras' "Strella", a film that greatly inspires me personally. Both Manos Protopappas and Marilena Kavasi are extremely talented actors, and Filothei is one of my favorite rising stars in the Greek drag scene. Song River: Do you feel that every film- whether short of full-length must have a resolution met at the end of the film or can things be left unanswered? Natalia Bougadelli: No. Life doesn't always offer resolutions, and art is but a reflection of life. Things can be left unanswered, or a catharsis can be offered at the end, depending on what best serves the point that the film is trying to communicate. Song River: Have you always used film as a way of telling others what is in your mind and heart? Natalia Bougadelli: The personal often is a direct reflection of the social and the public. In that sense, yes, film has always been my medium of choice. I'm also a photographer, and both media have been a part of my life from a very young age. In film and in photography we get to reproduce and/or challenge what we see and experience. For that reason, and for the immediacy it offers, I will continue to work in film. Song River: How long have you been filmmaking? 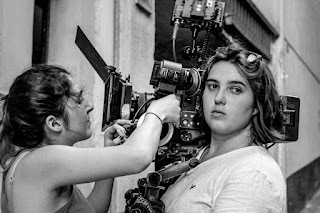 Natalia Bougadelli: "The Owls" was the first short film that I directed and shot. I have worked on numerous sets in various positions, but I primarily work as a director of photography. I studied Film and Television at New York University, but from a very young age I was involved with the field. I knew that I wanted to shoot and direct since I first remember myself. Song River: During the process of making this film, were there any moments that you thought maybe you shouldn't be so open and truthful? Natalia Bougadelli: When you are trying to tell a story like the story of "The Owls" you are often met with resistance. This resistance might make you reconsider your approach, but at the end of the day art is a space where you can be truly open and honest with your audience. Truth is both about informing people of facts, and about reminding them to look inwardly.